The amazing PMP560M Powered Mixer packs tremendous power (2 x 250 Watts dual mono), while maintaining an incredible power-to- weight ratio. These mixers employ high-efficiency Class-D technology and a state-of-the-art switch-mode power supply, which significantly reduces weight and heat. The 10-channel PMP560M features 6 high-quality `Invisible` IMP mic preamps (2 of which also accept our ULM Digital Wireless Microphones, available separately), our `one-knob` compressors and a eighth inch Aux Input for playing music from your smart devices. For that extra professional touch, we added a KLARK TEKNIK 24-bit Multi- FX processor with 25 presets including studio-class reverbs, delays, pitch shifter and various multi-effects, plus dual 7-band graphic EQs with our proprietary FBQ Feedback Detection System – for the ultimate in feedback- free performance. The powerful PMP560M is the very model of simple, but stunning performance - with 2 x 250-Watt (selectable as Main/Main, or Main/Monitor), for a combined total of 500 Watts. 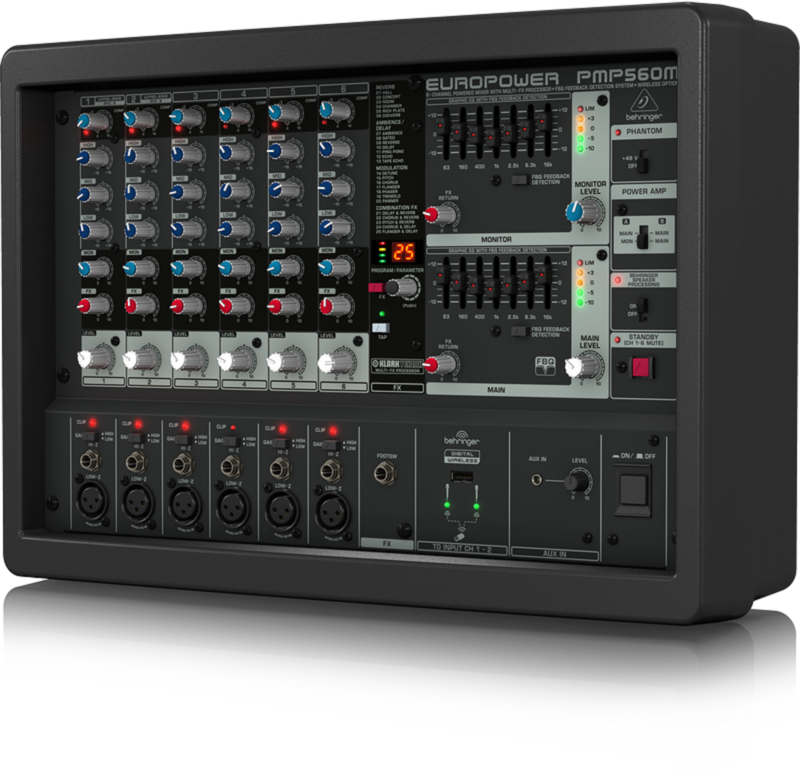 Whether the center of attention happens to be a jam band at the local blues club, a folk trio in the park, or the men`s choir at a special event - the PMP560M can handle it all with ease! This sonic versatility also makes it an excellent choice for churches, where vocals and stereo recordings often share face time.